For other uses, see Citron (disambiguation). Not to be confused with Citroën. 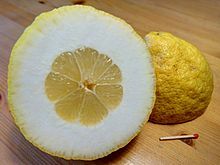 In Italian it is known as cedro. In Persian languages, it is called turunj, as against naranj ('bitter orange'). Both names were borrowed into Arabic and introduced into Spain and Portugal after their occupation by Muslims in AD 711, whence it became the source of the name orange. In Syria it is called kabbad; in Japanese it is called bushukan (possibly referring only to the fingered varieties). In Hebrew, the citron is known as etrog (אתרוג‎). In Gujarati it is called bijora (બીજોરા). In Chinese, it is known as xiāngyuán (香橼). The citron is an old and original citrus species. There is molecular evidence that most cultivated citrus species arose by hybridization of a small number of ancestral types, including citron, pomelo, mandarin and to a lesser extent, papedas and kumquat. The citron is usually fertilized by self-pollination. This results in them displaying a high degree of genetic homozygosity, and it is the male parent of any citrus hybrid rather than a female one. The citron is thought to have been native to India, in valleys at the foothills of the eastern Himalayas. It is thought that by the 4th century BC, when Theophrastus mentions the "Persian or Median apple", the citron was mostly cultivated in the Persian Gulf on its way to the Mediterranean basin, where it was cultivated during the later centuries in different areas as described by Erich Isaac. Many mention the role of Alexander the Great and his armies as they attacked Persia and what is today Pakistan, as being responsible for the spread of the citron westward, reaching the European countries such as Greece and Italy. Leviticus mentions the "fruit of the beautiful ('hadar') tree" as being required for ritual use during the Feast of Tabernacles (Lev. 23:40). According to Rabbinical tradition, the "fruit of the tree hadar" refers to the citron. The Egyptologist and archaeologist Victor Loret claimed to have identified it depicted on the walls of the botanical garden at the Karnak Temple, which dates back to the time of Thutmosis III, approximately 3,000 years ago. The citron has been cultivated since ancient times, predating the cultivation of other citrus species. In the east and south there are special plants... i.e. in Media and Persia there are many types of fruit, between them there is a fruit called Median or Persian Apple. The tree has a leaf similar to and almost identical with that of the andrachn (Arbutus andrachne L.), but has thorns like those of the apios (the wild pear, Pyrus amygdaliformis Vill.) or the firethorn (Cotoneaster pyracantha Spach. ), except that they are white, smooth, sharp and strong. The fruit is not eaten, but is very fragrant, as is also the leaf of the tree; and the fruit is put among clothes, it keeps them from being moth-eaten. It is also useful when one has drunk deadly poison, for when it is administered in wine; it upsets the stomach and brings up the poison. It is also useful to improve the breath, for if one boils the inner part of the fruit in a dish or squeezes it into the mouth in some other medium, it makes the breath more pleasant. The seed is removed from the fruit and sown in the spring in carefully tilled beds, and it is watered every fourth or fifth day. As soon the plant is strong it is transplanted, also in the spring, to a soft, well watered site, where the soil is not very fine, for it prefers such places. And it bears its fruit at all seasons, for when some have gathered, the flower of the others is on the tree and is ripening others. Of the flowers I have said those that have a sort of distaff [meaning the pistil] projecting from the middle are fertile, while those that do not have this are sterile. It is also sown, like date palms, in pots punctured with holes. This tree, as has been remarked, grows in Media and Persia. There is another tree also with the same name of "citrus," and bears a fruit that is held by some persons in particular dislike for its smell and remarkable bitterness; while, on the other hand, there are some who esteem it very highly. This tree is used as an ornament to houses; it requires, however, no further description. It has been found, however, that this tree will grow nowhere except in Media or Persia. It is this fruit, the pips of which, as we have already mentioned, the Parthian grandees employ in seasoning their ragouts, as being peculiarly conducive to the sweetening of the breath. We find no other tree very highly commended that is produced in Media. Citrons, either the pulp of them or the pips, are taken in wine as an antidote to poisons. A decoction of citrons, or the juice extracted from them, is used as a gargle to impart sweetness to the breath. The pips of this fruit are recommended for pregnant women to chew when affected with qualmishness. Citrons are good, also, for a weak stomach, but it is not easy to eat them except with vinegar. The citron fruit is usually ovate or oblong, narrowing towards the stylar end. However, the citron's fruit shape is highly variable, due to the large quantity of albedo, which forms independently according to the fruits' position on the tree, twig orientation, and many other factors. The rind is leathery, furrowed, and adherent. The inner portion is thick, white and hard; the outer is uniformly thin and very fragrant. The pulp is usually acidic, but also can be sweet, and even pulpless varieties are found. Most citron varieties contain a large number of monoembryonic seeds. They are white, with dark innercoats and red-purplish chalazal spots for the acidic varieties, and colorless for the sweet ones. Some citron varieties are also distinct, having persistent styles, that do not fall off after fecundation. Those are usually promoted for etrog use. Some citrons have medium-sized oil bubbles at the outer surface, medially distant to each other. Some varieties are ribbed and faintly warted on the outer surface. 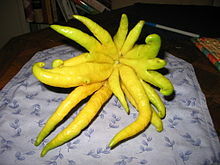 There is also a fingered citron variety called Buddha's hand. The color varies from green, when unripe, to a yellow-orange when overripe. 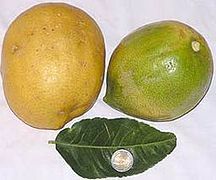 The citron does not fall off the tree and can reach 8–10 pounds (4–5 kg) if not picked before fully mature. However, they should be picked before the winter, as the branches might bend or break to the ground, and may cause numerous fungal diseases for the tree. Despite the wide variety of forms taken on by the fruit, citrons are all closely related genetically, representing a single species. Genetic analysis has shown known cultivars to divide into three clusters, a Mediterranean cluster thought to have originated in India, and two clusters predominantly found in China, one representing the fingered citrons, and another consisting of non-fingered varieties. Citrus medica is a slow-growing shrub or small tree that reaches a height of about 8 to 15 ft (2 to 5 m). It has irregular straggling branches and stiff twigs and long spines at the leaf axils. The evergreen leaves are green and lemon-scented with slightly serrate edges, ovate-lanceolate or ovate elliptic 2.5 to 7.0 inches long. Petioles are usually wingless or with minor wings. The clustered flowers of the acidic varieties are purplish tinted from outside, but the sweet ones are white-yellowish. The citron tree is very vigorous with almost no dormancy, blooming several times a year, and is therefore fragile and extremely sensitive to frost. The acidic varieties include the Florentine and Diamante citron from Italy, the Greek citron and the Balady citron from Israel. The sweet varieties include the Corsican and Moroccan citrons. Between the pulpless are also some fingered varieties and the Yemenite citron. 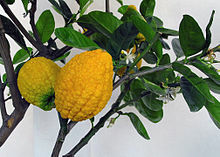 There are also a number of citron hybrids; for example, ponderosa lemon, the lumia and rhobs el Arsa are known citron hybrids, some are claiming that even the Florentine citron is not pure citron, but a citron hybrid. While the lemon or orange are peeled to consume their pulpy and juicy segments, the citron's pulp is dry, containing a small quantity of insipid juice, if any. The main content of a citron fruit is the thick white rind, which adheres to the segments and cannot be separated from them easily. The citron gets halved and depulped, then its rind (the thicker the better) is cut in pieces, cooked in sugar syrup, and used as a spoon sweet, in Greek known as "kitro glyko" (κίτρο γλυκό), or it is diced and caramelized with sugar and used as a confection in cakes. In Samoa a refreshing drink called "vai tipolo" is made from squeezed juice. It is also added to a raw fish dish called "oka" and to a variation of palusami or luáu. Citron is a regularly used item in Asian cuisine. The variety of citron used in Japan, yuzu, is juiced, and the juice is used regularly in dipping sauces, dressings and marinades. The juice is widely available bottled like lemon juice. Grated or shredded yuzu rind is also added to marinades and desserts, and hollowed out yuzu can be seen as decorative containers in higher end restaurants. In Korea, a popular tea, yuja-cha, is made by mixing citron meat and julienned peels with sugar and honey. This tea is consumed both hot and iced, and is often taken for sore throats and colds in winter. Today the citron is used for the fragrance or zest of its flavedo, but the most important part is still the inner rind (known as pith or albedo), which is a fairly important article in international trade and is widely employed in the food industry as succade, as it is known when it is candied in sugar. The dozens of varieties of citron are collectively known as Lebu in Bangladesh, West Bengal, where it is the primary citrus fruit. In Iran, the citron's thick white rind is used to make jam; in Pakistan the fruit is used to make jam but is also pickled; in South Indian cuisine, some varieties of citron (collectively referred to as "Narthangai" in Tamil) are widely used in pickles and preserves. In Kutch, Gujarat, it is used to make pickle, wherein entire slices of fruits are salted, dried and mixed with jaggery and spices to make sweet spicy pickle. In the United States, citron is an important ingredient in holiday fruitcakes. From ancient through medieval times, the citron was used mainly for medical purposes: to combat seasickness, pulmonary troubles, intestinal ailments, scurvy and other disorders. The essential oil of the flavedo (the outermost, pigmented layer of rind) was also regarded as an antibiotic. Citron juice with wine was considered an effective antidote to poison, as Theophrastus reported. In the Ayurvedic system of medicine, the juice is still used for treating conditions like nausea, vomiting, and excessive thirst. The juice of the citron has a high Vitamin C content and is used in the Indian system of medicine as an anthelmintic, appetizer, tonic, in cough, rheumatism, vomiting, flatulence, haemorrhoids, skin diseases and weak eyesight. There is an increasing market for the citron for the soluble fiber (pectin) found in its thick albedo. The citron is used by Jews (the word for it in Hebrew is etrog) for a religious ritual during the Jewish harvest holiday of Sukkot, the Feast of Tabernacles; therefore, it is considered to be a Jewish symbol, one found on various Hebrew antiques and archaeological findings. Citrons used for ritual purposes cannot be grown by grafting branches. A variety of citron native to China has sections that separate into finger-like parts and is used as an offering in Buddhist temples. For many centuries, citron's fragrant essential oil has been used in perfumery, the same oil that was used medicinally for its antibiotic properties. Its major constituent is limonene. ^ Klein, J. (2014). "Citron Cultivation, Production and Uses in the Mediterranean Region". In Z. Yaniv; N. Dudai (eds.). Medicinal and Aromatic Plants of the Middle-East. Medicinal and Aromatic Plants of the World. 2. Springer Netherlands. pp. 199–214. doi:10.1007/978-94-017-9276-9_10. ISBN 978-94-017-9275-2. ^ "Citrus medica" (PDF). plantlives.com. ^ "Buddha". University of California, Riverside. ^ E. Nicolosi; Z. N. Deng; A. Gentile; S. La Malfa; G. Continella; E. Tribulato (June 2000). "Citrus phylogeny and genetic origin of important species as investigated by molecular markers". Theoretical and Applied Genetics. 100 (8): 1155–1166. doi:10.1007/s001220051419. ^ Noelle A. Barkley; Mikeal L. Roose; Robert R. Krueger; Claire T. Federici (May 2006). "Assessing genetic diversity and population structure in a citrus germplasm collection utilizing simple sequence repeat markers (SSRs)". Theoretical and Applied Genetics. 112 (8): 1519–1531. doi:10.1007/s00122-006-0255-9. PMID 16699791. Retrieved 2018-12-04. ^ Asad Asadi Abkenar; Shiro Isshiki; Yosuke Tashiro (1 November 2004). "Phylogenetic relationships in the 'true citrus fruit trees' revealed by PCR-RFLP analysis of cpDNA". Scientia Horticulturae. 102 (2): 233–242. doi:10.1016/j.scienta.2004.01.003. ^ C. A. Krug (June 1943). "Chromosome Numbers in the Subfamily Aurantioideae with Special Reference to the Genus Citrus". Botanical Gazette. 104 (4): 602–611. doi:10.1086/335173. JSTOR 2472147. ^ R. Carvalho; W. S. Soares Filho; A. C. Brasileiro-Vidal; M. Guerra (March 2005). "The relationships among lemons, limes and citron: a chromosomal comparison". Cytogenetic and Genome Research. 109 (1–3): 276–282. doi:10.1159/000082410. ^ a b c Wu, Guohong Albert; Terol, Javier; Ibanez, Victoria; López-García, Antonio; Pérez-Román, Estela; Borredá, Carles; Domingo, Concha; Tadeo, Francisco R; Carbonell-Caballero, Jose; Alonso, Roberto; Curk, Franck; Du, Dongliang; Ollitrault, Patrick; Roose, Mikeal L. Roose; Dopazo, Joaquin; Gmitter Jr, Frederick G.; Rokhsar, Daniel; Talon, Manuel (2018). "Genomics of the origin and evolution of Citrus". Nature. 554 (7692): 311–316. doi:10.1038/nature25447. ^ Inquiry into Plants 4.iv.2. ^ Erich Isaac (January 1959). "The Citron in the Mediterranean: a study in religious influences". Economic Geography. 35 (1): 71–78. doi:10.2307/142080. JSTOR 142080. ^ a b "Citron: Citrus medica Linn". Purdue University. ^ Frederick J. Simoons (1990). Food in China: a cultural and historical inquiry. CRC Press. p. 200. ISBN 9780849388040. ^ "ethrog". University of California, Riverside. ^ Marion Eugene Ensminger; Audrey H. Ensminger (1993). Foods & Nutrition Encyclopedia. volume 1 (2nd ed.). CRC Press. p. 424. ISBN 9780849389818. ^ Francesco Calabrese (2003). "Origin and history". In Giovanni Dugo; Angelo Di Giacomo (eds.). Citrus: The Citrus Genus. CRC Press. p. 4. ISBN 9780203216613. ^ H. Harold Hume (2007). Citrus Fruits and Their Culture. Read Books. p. 59. ISBN 9781406781564. ^ Emanuel Bonavia (1888). The Cultivated Oranges and Lemons, Etc. of India and Ceylon. W. H. Allen. p. 255. ^ Britain), Royal Horticultural Society (Great (1894). "Scientific Committee, March 28, 1893: The Antiquity of the Citron in Egypt". Journal of the Royal Horticultural Society. 16. ^ Ramón-Laca, L. (Winter 2003). "The Introduction of Cultivated Citrus to Europe via Northern Africa and the Iberian Peninsula". Economic Botany. 57 (4): 502–514. doi:10.1663/0013-0001(2003)057[0502:tiocct]2.0.co;2. ^ Historia plantarum 4.4.2-3 (exc. Athenaeus Deipnosophistae 3.83.d-f); cf. Vergil Georgics 2.126-135; Pliny Naturalis historia 12.15,16. ^ "Chap. 31.—The Citron-Tree". Perseus Digital Library. Tufts University. excerpting from John Bostock; H.T. Riley, eds. (1855). The Natural History. Pliny the Elder. London: Taylor and Francis. ^ "Pliny the Elder, The Natural History, Book XII. The Natural History of Trees, Chap. 7. (3. )—How the Citron Is Planted". Tufts University. ^ "Pliny the Elder, The Natural History, Book XXIII. The Remedies Derived from the Cultivated Trees., Chap. 56.—Citrons: Five Observations upon Them". Tufts University. ^ Un curieux Cedrat marocain, Chapot 1950. ^ a b Ramadugu, Chandrika; Keremane, Manjunath L; Hu, Xulan; Karp, David; Frederici, Claire T; Kahn, Tracy; Roose, Mikeal L; Lee, Richard F. (2015). "Genetic analysis of citron (Citrus medica L.) using simple sequence repeats and single nucleotide polymorphisms". Scientia Horticulturae. 195: 124–137. ^ "Website Disabled". University of California, Riverside. Archived from the original on 2008-03-08. ^ Meena, Ajay Kumar; Kandale, Ajit; Rao, M. M.; Panda, P.; Reddy, Govind (2011). "A review on citron-pharmacognosy, phytochemistry and medicinal uses". The Journal of Pharmacy. 2 (1): 14–20. ^ "Candied Citron". Vine Tree Orchards. ^ "Bijora Pickle". Jain World. 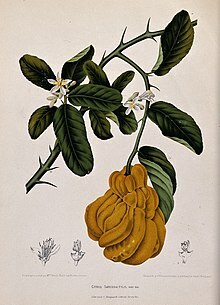 ^ "Matulunga (Citrus medica)". frlht.org. Archived from the original on 2013-12-24. ^ Dalia A. Abdul. "Preparation and Characterization of Pectin from Peel of Kabad (Citrus Medica) Fruit in Sulaimani City, Iraqi Kurdistan Region" (PDF). International Journal of Current Research in Chemistry and Pharmaceutical Sciences. 1 (7): 142–146. Ratchada Tangwongchai; K. Lerkchaiyaphum; Kasem Nantachai; T. Rojanakorn (November 2006). "Pectin extraction from Citron peel (Citrus medica Linn.) and its use in food system". Songklanakarin Journal of Science and Technology. 28 (6): 6 – via ResearchGate. Frederick Hardy (1924). "The Extraction of Pectin from the Fruit Rind of the Lime (Citrus medica acida)". Biochemical Journal. 18 (2): 283–290. doi:10.1042/bj0180283. PMC 1259415. PMID 16743304. "Nutritional compostions comprising a soluble viscous fiber in a solid crisp matrix: United States Patent Application 20060078593". Free Patents Online. Jan Ridgely. "Facts on fibre". Peak of Health. ^ Inouye, S.; Takizawa, T.; Yamaguchi, H. (2001). "Antibacterial activity of essential oils and their major constituents against respiratory tract pathogens by gaseous contact". Journal of Antimicrobial Chemotherapy. 47 (5): 565–573. doi:10.1093/jac/47.5.565. PMID 11328766. G. S. Nijjar, "Fruit Breeding in India"
Wikimedia Commons has media related to Citrus medica and Citrons (Citrus medica).